Commuting to work has been a topic of many conversations. We all discuss and explore our options: walking, cycling, driving, car sharing, or staying with the good old public transport. For people working, offshore choices are limited and safety concerns are high and many. 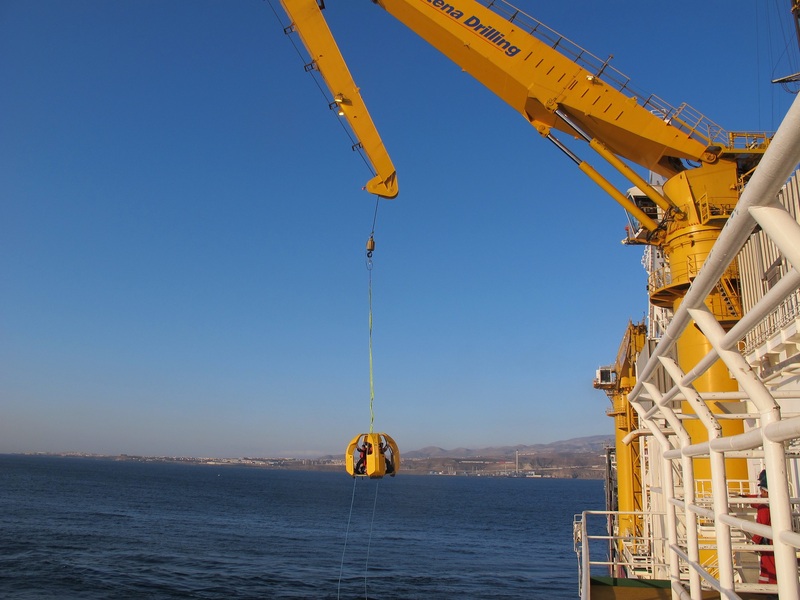 Reflex Marine Ltd, a company founded over 25 years ago, dedicates all its time and resources to developing and facilitating safe crew transfers by crane. FROG, Reflex Marine’s main product, found its way to all continents and their many offshore platforms, vessels and installations. FROGs helps transfer over a million offshore workers each year; it’s a simple yet safe, efficient and flexible way to reach your work post on the sea. Earlier this month, we sat down with Sandra Antonovic, Chief Operating Officer for Reflex Marine and we talked about revolutionising marine transfer. Maybe we could start by quickly summarising what is it that you do at Reflex Marine? The role of Chief Operating Officer is a very complex and layered one in any company, maybe more so in Reflex Marine, because we are small in number of people (less than 20), yet we cover the market globally and are involved in all stages of product development, product testing, product manufacturing, product marketing, positioning and placement, and finally post-sale client support and service. The very essence of my job is understanding the market and the ways it grows, changes and/or shifts; creating a space for our company in that market and then making sure we deliver in the most efficient and effective way possible. It is an incredibly interesting, eclectic and multi-faceted job covering anything from designing, negotiating and closing a fleet deal with a major client, to looking at the cash flow or projected earnings. How do you ensure you can effectively do your job without feeling overwhelmed? People reach corporate or C-suite positions because they have the ability to stay focused regardless of what goes on, they can filter through the noise and they are able to make decisions in matter of seconds, if necessary. These people perform best in high-paced, very demanding environments, and they are able to deliver in the most strenuous circumstances. Their motivation, their drive and their stamina comes from within, not from the outside. Once your motivation starts depending on other people or circumstances, you are limiting yourself and what you can achieve. At the very beginning of my career, almost 25 years ago, I understood that growth, both personal and professional; but also the growth of a business; is all about willingness to accept responsibility and accountability, as well as about being comfortable outside your comfort zone. A lot of people in the offshore industry, particularly offshore safety, say that Reflex Marine revolutionised marine transfer. What is it like to work for such a company, and how do you see that ‘revolution’? Yes, you are absolutely right, Reflex Marine very much revolutionised the way people think about offshore crew transfer; and it certainly revolutionised marine transfer. Almost singlehandedly, Reflex Marine transformed marine transfer from an obsolete and risky operation to one of the safest methods of crew transfer offshore. We remained revolutionaries over the years, in how we do business, in how we approach the market and in how we keep reinventing ourselves; never forgetting our prime purpose: designing and delivering products that ensure the highest level of offshore safety. Working for Reflex Marine has always been a great honour for me. You say that Reflex Marine remained a revolutionary over the years. Could you please expand on that? Reflex Marine has always been and always will be a company that pushes the boundaries and explores the unexplored, not just in what kind of products we design and manufacture, but in how we do it. When we talk about offshore crew transfer, it often sounds “either/or” – either you use helicopters, or you use crane transfer; either you use crane transfer, or you use gangway. In practice, in real life situations, things are never that black or white. Commuting to work onshore looks simple in comparison. Every morning we make a choice how to get to work – walking, cycling, taking the metro, or a bus, or driving a car. Going to work offshore doesn’t give us that many options, and the way of commuting is predefined by the operator. Helicopters are good for getting people from the port to remote installations in deep water; gangways are useful when we need to get large number of crew from a vessel to the platform; and then there is transfer by crane, which gives flexibility and cost effectiveness. Thirty years ago, transferring people by crane had its challenges – people were transferred in net ‘baskets’, unprotected and exposed. “How can we keep the cost effectiveness and flexibility offered by crane transfer while ensuring people are safe and protected from impacts and harsh weather?”, was the question Philip Strong, Reflex Marine’s CEO and the person behind the FROG idea, kept asking himself as he embarked on a journey of improving safety of offshore crew transfer. Several years later, the first FROG was sold. The original FROG range was launched in 1999 and fifteen years later, the re-designed and re-engineered FROG-XT range was introduced to the global market. Would you say that design and technical features helped your product differentiate itself on the market and would you say it helped you define the unique selling proposition? Very much so. The FROG-XT Personnel Transfer Carriers (PTCs) are personnel transfer device designed to provide increased passenger protection when carrying out the transfer of personnel between vessels and installations. Crane personnel transfers are carried out for a wide variety of reasons including routine, urgent operational and emergency reasons. The FROG-XT can accommodate a stretcher to transfer injured personnel in a protected environment. ‘The FROG-XT comprises the following two main assemblies: firstly, the stainless steel outer framework containing polyethylene buoyancy panels; secondly, a spring-dampened seating assembly mounted on a central column. All materials have been selected specifically to minimise corrosion in the marine environment. The outer framework protects passengers from impacts and contains the buoyant elements which ensure the FROG-XT floats and is self-righting in water. The outer shell lands on four feet that provide shock absorption and ensure that the FROG-XT is stable on uneven surfaces or when landing on a heaving vessel. The outer shell also has four large open accesses that allow rapid unimpeded entry and exit. During transit passengers are seated and secured with full harnesses to protect them against whiplash and falling. Seating is mounted on a sprung carriage to provide protection against heavy landings. The lifting assembly is of a special design to prevent rotation. Each Reflex Marine personnel transfer product is specified within the following controlled documents: » Build Manual – A controlled document with all relevant manufacture and assembly instructions and quality and documentation requirements; » Drawing Package – A complete listing of all pertinent drawings (in all pertinent to the model and revision); » Design Dossier – A controlled document with all relevant, design calculations and standards, risk assessments and compliance testing data; » User Manual – A controlled document with the required end-user information and maintenance and inspection requirements for use throughout the product life. Safety of the transfer operation is both a function of the design and of the operation of the FROG-XT unit. The FROG-XT Design Dossier sets out to establish the performance expectations and define the safe operating envelop of the design and to understand the risks of operation and how these might be operationally mitigated and controlled. There are large number of factors that affect the safe conduct of marine personnel transfers. These include crew skill and experience, met-ocean conditions, landing areas, vessel station keeping capability and response to sea conditions, visibility and line of sight. A combination of many factors will determine the risk involved. What is the situation in the offshore industry generally, when we talk about safety in crew transfer? Before Reflex Marine’s work began, there was no central database for marine transfer incidents. By collecting and analysing data spanning a 20-year period, the company was been able to isolate when and where these incidents happen. Crucially, this allows us to consider how best to protect personnel with the carriers we create. As expected, the study showed that most incidents happen on the vessel itself. Less predictable was the high level taking place during pick-up, which can result in serious injuries or fatalities, compared to those caused by heavy landing, which are more likely to result in minor injuries. From detailed analysis, it was found that many incidents are caused by the pendulum ‘swing factor’: an often unavoidable misalignment between the crane line and the transfer device. The research showed that the pivotal risk factors in transfers are equipment design and crane operating error. Very few incidents relate directly to the condition of the transfer device or crane; instead, the design of the equipment often has a powerful effect on its safety. A lack of training, planning and preparation was also a concern in a considerable number of the incidents studied. Using these findings, Reflex Marine tailored their carriers to address the specific risks crews face. With falls during pick-up causing serious injuries or even fatalities, Reflex Marine developed devices that offer additional safety measures. Passenger fall restraints are a design essential in all of their carriers, preventing loss of grip or dislodging. A protective outer frame and buoyancy panels reduce the dangerous effects of side impact, which frequently results from the pendulum ‘swing factor’. Reflex Marine also put in place comprehensive training programmes to encourage safe practice. We touched a few times on a new market approach the company developed. Tell us a bit more about that. Reflex Marine Ltd designs, engineers, manufactures and markets crew transfer carriers, also known as FROGs. The company was founded 25 years ago, and our dedication to safety and efficiency earned us over one million transfers per year, with over eight consecutive years without a lost time incident. We were always very focused on the quality and safety. The last oil price downturn, a few years ago, showed us that we need to be equally focused on the market and The Client. Our core market has always been offshore oil and gas. IOCs, drilling companies, supply vessel companies. We never really looked elsewhere, at least not in the strategic, long-term way. The oil price was stable, purchase orders were coming through, market share sounded okay, and we carried on for years. Our main ambition was to improve our original FROG range; and we certainly did that with our FROG-XT range, launched back in 2014. We were proud of our work and product innovation, delivered by our in-house designers and engineers. We were then, and still are today, the only manufacturer of personnel transfer carriers delivering the products developed and rigorously tested taking into the account different body types, impacts different operational transfer situations might have on a human body, human behaviour and weather conditions. FROG-XT range was tested using techniques and approach very similar to those testing a VOLVO car. We were keen to deliver the safest crew transfer option, and we succeeded. One question remained, though – how do we make sure we can continue our work amidst severe market fluctuations that are impacting our bottom line? Looking back, the answer now seems obvious, but back in 2015 it raised a few eyebrows and meant the entire team had to get outside of their comfort zone. We decided to diversify to other offshore sectors. We started researching merchant shipping, tankers, VLCCs, ports, navy and coastal guard, and yes, LNG. The potential was enormous. Our decision to diversify triggered many changes in how we work and with whom. We were actively pursuing the market and we started creating our own opportunities through layers of activities: editorials and interviews; attending and exhibiting at large expos; speaking at conferences; organising webinars and using any and every other opportunity to share our knowledge and experience. We never chased contracts, we chased opportunities to share what we know, for free. We chased opportunities to discuss and debate; but most of all, we chased the opportunities to listen and learn. The narrative became very important – the context – why did something happen, how did it happen, what caused it and so on. The company used to look at numbers only, revenue, expenses, manufacturing costs, overheads. Having a more corporate finance angle and approach the entire team started to appreciate the need and importance to have narratives accompanying every report, and to have an understanding of the context. We focused on analysis, on market research, on understanding our weaknesses and on working hard to mitigate the risks they could have created. We became very bold in our thinking; and it helped with the general attitude and team’s confidence. We recognised that the market conditions changed. While that change started long before the oil price drop, it became evident and emphasised during the last oil price crisis. The cost of oil production offshore has always been high, so it comes as no surprise that oil operators and the industry’s supply chain generally made a lot of effort to reduce the time of exploration and production. What used to take two years, now takes eight months, and so on. For suppliers that meant only one thing – adapt, and do it fast. You have to reduce your lead time, your transit time, you have to lower the prices and you have to be available 24/7. Flexibility and responsiveness are the key ingredients. Reflex Marine reduced the number of its employees by 30%, but increased productivity and responsiveness by 50-60%. We have a much better understanding of the global markets and we are able to see and comprehend the fine layers of the industry. We moved from a company that operates from 9-5 in one time zone, to a company that operates almost 24/7 in all time zones. It doesn’t mean people don’t sleep; it just means we do things in a very different way than we used to. The focus is on the outside, on the market, on the client, and on our role in helping them solve their problems. The change in focus changed everything for us. Defining and developing a strategy for any region inevitably includes understanding the wider geopolitical context, market volatility, currency fluctuations, and inevitably, the oil price trend. Having that context helped us define and deliver the strategy that improves, strengthens and facilitates the operations of our clients. What is the role of international agreements, regulations and bodies in understanding SWOT analytics and strategy planning? International agreements, regulations and regulatory bodies can have quite a significant role in strategy planning and looking at SWOT analysis. One of the most recent examples is when Brazilian regulatory body for offshore operations changed the regulation on what types of carriers can be used to move people back and forth while working offshore. That change stipulates that people have to be seated, and we are one of two companies that manufactures personnel transfer carriers for seated passengers. Needless to say this change had and will have a huge impact on our strategy, from supply chain, manufacturing, post-sale approach, market communications and general focus. What is next for Reflex Marine? Keep innovating. Standing still is a terminal illness. We have a very defined idea on where we want to be two years from now, but also five and ten years from now. I see Reflex Marine as a company that will always be an innovator, both in products we place on the market, but more so in the approach we take and particularly, in how we execute our ideas. Execution will be the key, understanding the market and behavioural change is essential, without those things there is no real progress, no real revolution (laughs). I am confident and excited about Reflex Marine’s future.